Last month, MSN News reported the death of a 48-year-old man who was struck by a prong of a pitchfork attachment on another forklift while moving hay bales in Narrogin, Western Australia. Earlier this month, The Mercury reported a forklift-related death in Launceston, Tasmania. This time, the casualty was a 24-year-old man who was pinned underneath a forklift after it tipped to its side during the process of unloading. Occupational health and safety organisations such as WorkSafe Victoria, Safe Work South Australia, Department of Employment Queensland and WorkSafe Western Australia have taken action and built campaigns aiming to educate warehouse supervisors, managers and forklift operators on the dangers presented by forklifts. An example is the poster created by WorkSafe Victoria for their campaign ‘ Forklifts and people don’t mix’. 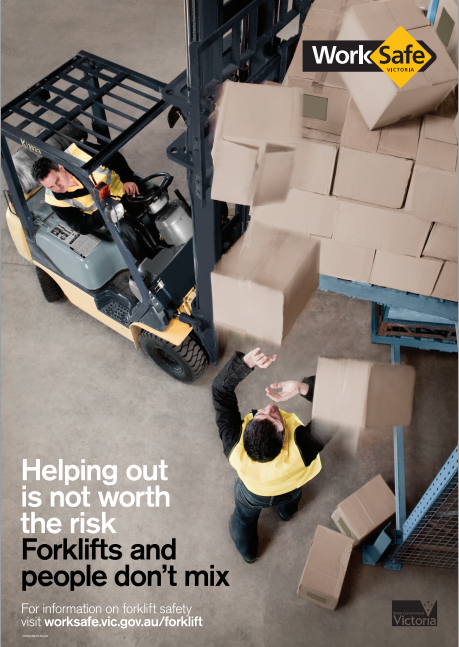 Aside from this WorkSafe Victoria has developed a handbook titled Forklift safety – Reducing the risks to help warehouse managers mitigate risks of forklift accidents. Workplace Health and Safety Queensland and Safe Work South Australia both have their own versions of this handbook. A well-maintained forklift is crucial to prevent accidents. There should also be a procedure for employees to follow in case they come across an unsafe forklift. Aside from this, the warehouse environment should also be monitored. Display this site map clearly in the facility and use bollards and guard rails where possible. Ensure your warehouse is well-lit to improve visibility, as a dark warehouse is prone to accidents. Make sure roads are well formed and clearly marked, remove blind corners and ensure intersections have proper lighting. Where necessary, use signs, safety barriers, containment fences, boom gates and even overhead walkways to maintain employee safety. It is recommended to install safety and visibility mirrors in various sections of the warehouse to allow forklift operators to see the movement in the warehouse in front of them or behind them. Strip doors further increase visibility. Despite all these measures, however, forklift accidents can still happen. It is important to note that such an accident can damage your facilities, equipment and inventory. To reduce risks of equipment damage, use material-handling equipment such as bollards and guard rails. Mitigate the additional risk of external contamination due to faulty doors caused by forklift accidents with high-speed roller doors that are built to adjust during a collision, sustain impact and can be reset easily.